Last week, my new gansey pattern came out, in ‘The Knitter’. It’s published in the supplement. I’ll put up some gansey alphabet PDFs for initials, for anyone thinking of knitting it – or any other gansey – in a day or two. But for now, here’s some info about the gansey itself. It was knitted in Wendy 5 ply Guernsey wool, Atlantic Blue. There are three other traditional shades – Aran, Navy and Crimson. It’s called ‘Lansallos’. Whilst I usually name them after vessels – to get away from the cliche that specific gansey motifs come from certain areas – I decided to name this after the place where its original wearer (and probably, knitter) came from; Lansallos, in Cornwall, so I could give it back to its original ‘owner’ in a way, as the design is not mine, just one I reverse engineered from a photo. Seated on the left: Charles Joliffe Sr, one-time landlord of The Three Pilchards Inn, Polperro. Centre: Charles Joliffe Jr. Seated right (and our gansey): James Curtis, who was Charles Jolliff’s Sr’s son-in-law. Little girl: Kate Curtis, born 1874, which dates the picture to around 1877. James was married to Emily Jolliffe (called ‘Emma’ in later censuses). In the censuses, our gansey-wearer, James was a merchant sailor, then “Fisherman”, later “Fishmonger” at Lansallos. Emily – who probably knitted the gansey – was from Lansallos, too. On the 1861 census, Emma’s occupation is “Knitter” and she is found on Census night visiting the Curtis family on Pier Head, in Lansallos. It’s rather cool – and rare – to be able to (possibly) put a name to a gansey’s knitter. The photo was taken by Victorian photographer, Lewis Harding, in his studio at Osprey Cottage, Polperro. It’s been reprinted in most of the published gansey books, and for good reason. To reverse engineer it, I had to get the best res image possible, blow it up on my screen, and literally count the purl bumps. Then I charted the pattern as well as I could. I think it’s reasonably accurate. Although I went off piste with the sleeve, putting in a pattern that echoed the sleeve on the centre gansey in the photo. One element of design I am fairly confident about was the little Indian Corn Stitch cable – fairly sure I’m not imagining that in the magnified version of the photo. 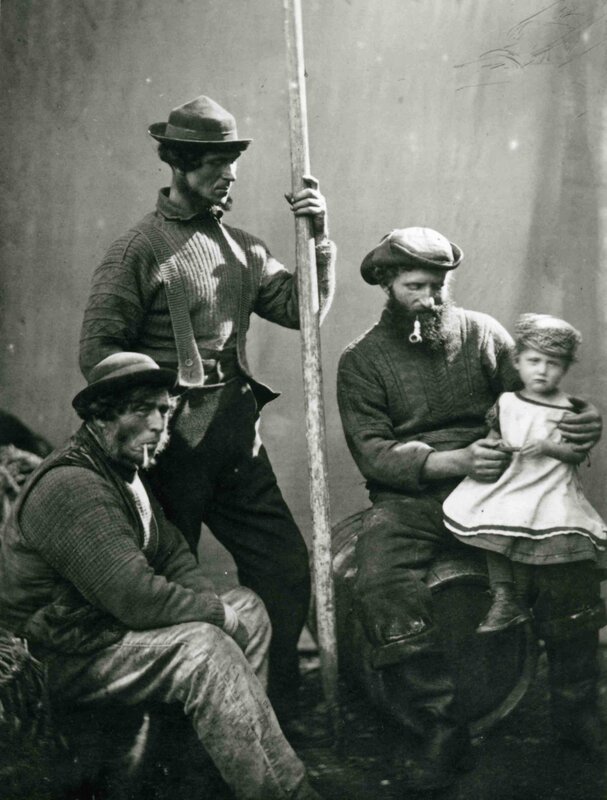 Polperro Heritage Press’s book “Lewis Harding – Cornwall’s Pioneer Photographer” is well worth a look, as is Mary Wright’s “Cornish Guernseys & Knit-Frocks”. The diamond and fern patterns in this Cornish gansey are the same as diamonds and ferns found on ganseys from elsewhere in the UK; diamonds, “nets” or “masks” also being extremely common on the inland waterways of Northern England. I kept the shoulder treatment straightforward, just as Emily Joliffe seems to have, in the original. The neck would be slightly deeper in the original – so if you’re knitting Lansallos and would prefer a more traditional-looking neckline, simply continue knitting a couple more inches. The tension was not so fine as this probably looks, so if you have yet to knit a gansey – this is probably a lot less daunting than it might look! I’ll put up a link here, to Lansallos in the Ravelry pattern pages, just as soon as one goes live. 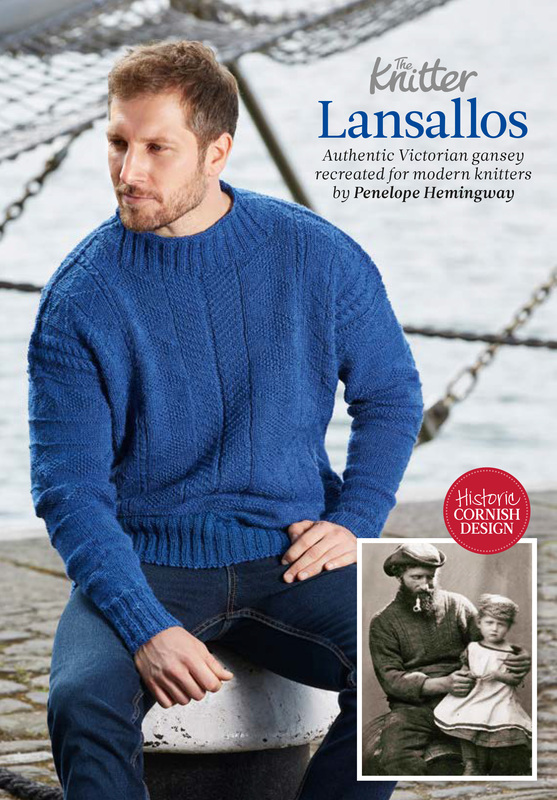 Lansallos is in Issue 103 of ‘The Knitter’ and will be in the shops for another three weeks, at the time of writing. Enjoy!